Background: Hawthorn (C. oxyacantha), a common edible plant, is widely used for the preparation of a different foodstuff and is also used in traditional medicine to treat heart problems and gastrointestinal ailments. Recently, a few patents of Crataegus preparation for protective effects (prevention of cardiovascular and hepatic diseases) have been developed. 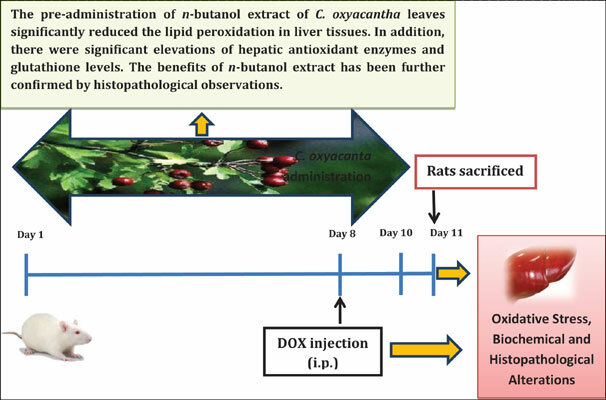 Objective: The current study aimed to explore the antioxidant and hepatoprotective effects of nbutanol extract of Crataegus oxyacantha leaves in acute liver damage induced by Doxorubicin (DOX). Methods: Crataegus oxyacantha (100 mg/kg body weight) or vitamin E as a standard antioxidant (100 mg/kg body weight) were administered orally to female rats for 10 days, in the presence or absence of hepatotoxicity induced by a single intraperitoneal (i.p.) injection of DOX (15 mg/kg on the 8th day). On day 11, blood and liver samples were analyzed for biomarker levels and histopathological changes. Liver homogenates were used for determination of oxidative stress parameters that include Malondialdehyde (MDA), Glutathione (GSH) level and Glutathione Peroxidase (GPx) activity. Results: Treatment with n-butanol extract of C. oxyacantha leaves significantly improved the altered liver enzyme activities and oxidative stress markers. The histopathological observations confirm the results of biochemical parameters. Conclusion: The obtained results support the traditional use of C. oxyacantha to cure gastrointestinal ailments and highlighted its possible use in the food and pharmaceutical industries as a source of natural antioxidant. Crataegus oxyacantha, antioxidant, hepatoprotective, doxorubicin, hepatotoxicity, oxidative stress.